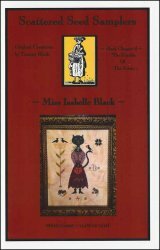 Miss Isabelle Black [H5364] - $12.00 : Yarn Tree, Your wholesale source for cross stitch supplies. A black cat is dressed for Halloween and is holding a jack-o-lantern to hold the treats she collects. A crow is perched on her tail and mice are nibbling on corn by her feet. Cross stitch design from Scattered Seed Samplers. Stitch count 114w x 151h.